If you work with a bunch of sticky-fingered co-workers, your desk is going to need protecting -- especially when you're away at lunch. This 3D-printed sentry gun from Swiss engineering student Kevin Thomas is motion-activated and fires a 6-round clip of rubber bands at anybody foolhardy enough to come within range. 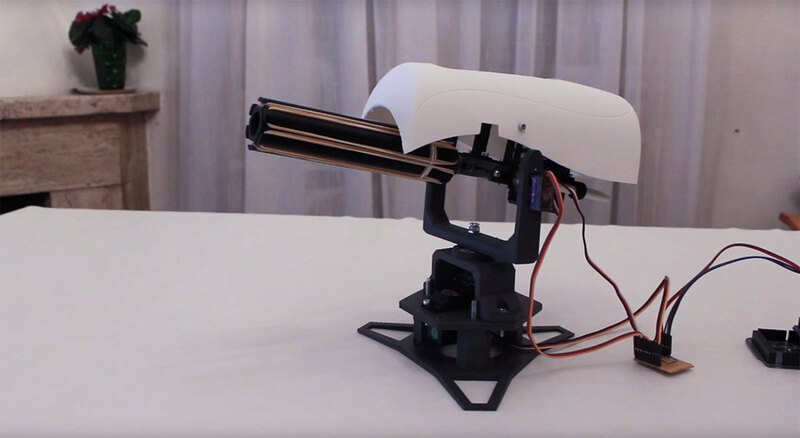 It's controlled with an Arduino chip running Thomas' version of the open-source Project Sentry Gun software. And if you don't want to let the sentry gun have all the fun, you can also switch it from autonomous mode and manually aim it using a joystick. With all the eyes you'll put out and SBC violations you'll incur with this menacing mechanization, you and the HR department are going to become such good friends.